Can you tell me about your company (what does your company do)? USANA Health Sciences is a U.S.-based company. We opened Australia office in year 1998. We manufacture high-quality supplements, personal care, energy, and weight-management products. Our products are used by more than 1000 professional athletes and are sold directly to Preferred Customers and Associates in 20 international markets. With our direct-selling model, we seek to only improve not only our Associates’ physical health, but also their financial health. What is your role (what do you look after)? I am in the marketing manager serving Australia and New Zealand. My responsibilities include overseeing our marketing team, coming up with effective marketing plans for our portfolio of products, coordinating the marketing efforts in different markets, working with our Associates, who sell our products to our customers directly, finding new ways to support them and help them succeed. How did this project (Digital Strategy and Blog Site) come about (What did you want to achieve that you couldn’t previously)? Keeping in touch with our customers and Associates, and keeping them informed of our new products and marketing strategies is one of the most important goals of our office. Today, social media is the most powerful, efficient and effective form of brand communication. It is the focal point for all online communications with USANA Associates and potential customers. Our reputation as the world’s premier nutritional supplements manufacturer lives on social media and we must continue to ensure that reputation remains strong by directing corporate communications through social media channels as well as through traditional channels. In order to strengthen our USANA branding through social media platforms, to increase traffic and improve the ranking of our blog site, we have refreshed our website in order to make better use of our content to build a stronger relationship with potential and existing customers, and to attract, engage, convert and retain more customers. What was the impact of that? The old blog site was built several years ago. It not user-friendly and very hard to maintain. It also lacked some modern features our customers and Associates expect, and it didn’t work very well on newer platforms like smartphones and tablets. Our new blog site fulfilled all these requirements, in a package that is both easier for us to maintain internally, and more user-friendly to our Associates and customers. Since the launch of our new site, we have received plenty of positive feedback from our customers and Associates. Tell us about the solution (service) you got from us? Content Maximiser provided both website design and development services to us. They studied our old blog site, listened to our requirements, worked with us on the new look and organisation of the blog site, provided us with suggestions for how to present our material in the most effective manner. What was the process we went through? Stage 1 – Content Maximiser has reviewed and analysed our old blog site, understanding our branding, our goals and objectives. They noted what worked well and what didn’t work so well, and helped us develop a strategy for our online presence. Stage 2 – Content Maximiser presented us with a proposal, outlining the framework for our new blog site, the improvements that can be made and the benefits to us and our Associates and customers. We had a good time working with Liza and her team, and we are very happy about the result. The outcome is great! Now our new blog site is very easy to navigate, user-friendly, and most importantly it has a good structure to display relevant blog posts and related videos. For people watching this, who could be in the situation you were in, what would your recommendation be for them? Social media is so much more than posting a status update on Facebook. It is necessary to have a complete digital strategy in order to truly engage your audience and facilitate communication. Content Maximiser is a full-service digital team of experts who not only creates and develops online strategies, but also helps bolster the company’s online reputation and works to optimize all online content for search. In addition, Content Maximiser will walk with you hand in hand to go through the whole project, which will make your life so much easier. 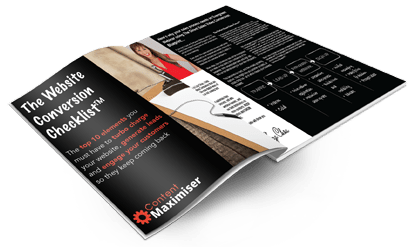 Content Maximiser will walk with you hand in hand to go through the whole project, which will make your life so much easier.